Seriously, there’s got to be something wrong with me! I actually expected that applying a new non-skid deck to TRIPLE THREAT, our 1981 Pearson Flyer, would be a fairly straightforward project. I always think like that before I get started. One would think I might know better by now, but that type of learning apparently requires some protein sequence that’s missing from my DNA. I started the project by removing all the hardware from the deck-winches, cleats, instruments, lights, sail tracks-everything. This included the old teak toe rails, which I would replace with extruded black anodized aluminum. My apologies to wooden boat enthusiasts, but since I primarily race our boat, maintaining wood trim is time wasted for me. After removing everything, I planned to apply the hardware bonding techniques described in the WEST SYSTEM® User Manual and repair manuals. Hardware bonding involves drilling all the existing holes oversized. These holes then get filled with thickened epoxy and the proper sized hole is re-drilled through the center of the epoxy when the hardware is ready to be remounted. Doing this would be a good way to protect the balsa core from moisture damage. 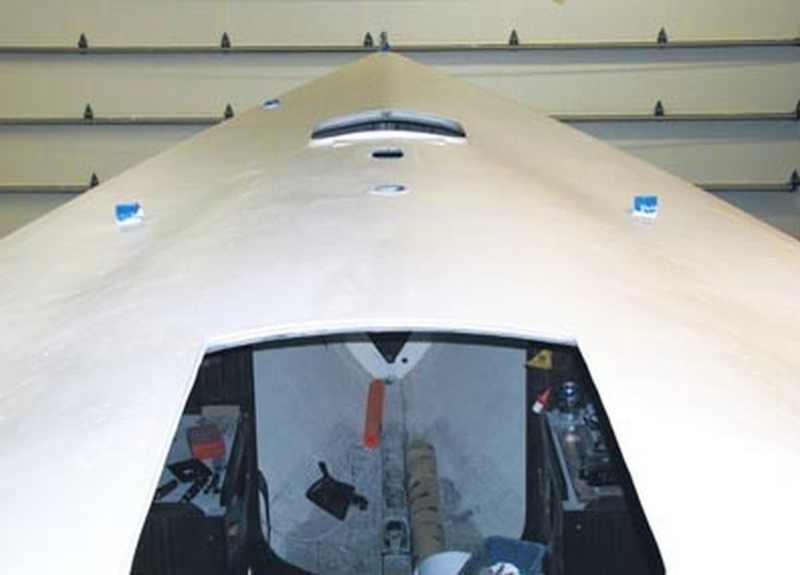 To replace the core involves removing the fiberglass skin to expose the core. This can be done either from the topside or below deck. In my case, since the deck was getting new non-skid anyway, the repair would be easier from the topside. Using a circular saw, shallow cuts were made just deep enough to cut through the top skin to open up the damaged area once the skin was removed. A series of cuts were needed, enlarging the area incrementally until good core was reached. 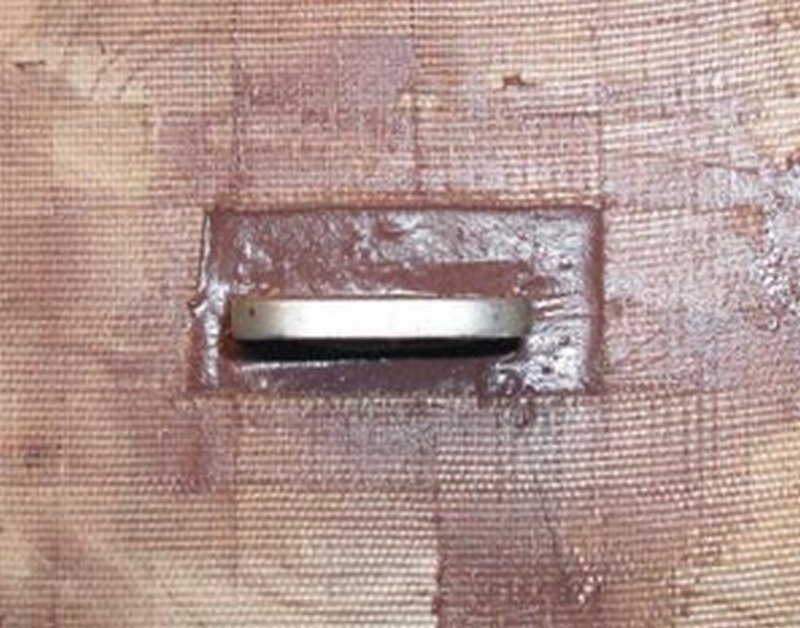 The bad core that didn’t come out with the glass skin was removed with a chisel. It may seem odd that rotten, wet balsa was still bonded securely enough that it had to be removed with a chisel. Many folks have the misconception that balsa is a poor choice for core material, that it will act like a sponge and disintegrate quickly if water gets to it. This is not the case. End grain balsa retains a high percentage of its compression strength and structural integrity for a surprisingly long time after it gets wet exactly because of the grain orientation. Water soaks in much more slowly perpendicular to the grain than it does with the grain-and the end grain is bonded to the skins, so it’s inaccessible. There was no softness in the deck or any indication of the core damage in the deck while the boat was in use last season. Eventually, there would have been, but since the boat is 20 years old, I was very impressed with how well the balsa performed over the years. Yes, it’s heavier than foam, but foam cores have their own weaknesses to be dealt with, and it’s wise to replace whatever core was originally used with the same material. Assuming the skins are the same, a balsa core laminate would be stiffer than a foam core laminate due to balsa’s higher density and shear modulus. Also, according to the Forest Products Laboratory ratings of numerous wood species regarding rot resistance, balsa has the same rating as okoume and meranti: mildly resistant. Okume and meranti are widely considered a good choice for marine applications especially when properly coated and installed. So, application and technique are the key factors in using any mildly resistant species of wood, balsa included. Since the skin was 1/8″ thick, I needed to grind 1½” back from the edge of the cut to make a 12:1 bevel. Next, ¾” contour core balsa was cut to fit the openings. The term ‘contour core’ means that the core, whether balsa or another core material, has a series of cuts through it. Typically these cuts run perpendicular to each other along the length and width about 1″ to 1½” apart, forming a grid of blocks that are held together by a loosely woven cloth called scrim. This allows the core to follow curvatures in the deck, whether convex or concave. One problem in using contour core is that the blocks of core will separate to some varying degree in conforming to a curve. The resulting gap must be filled to prevent water migration within the deck or hull. With this in mind, I installed the core using a two-step bonding technique. The first step was to brush neat (unfilled) WEST SYSTEM® 105/206 over the entire bonding surface inside the opening. 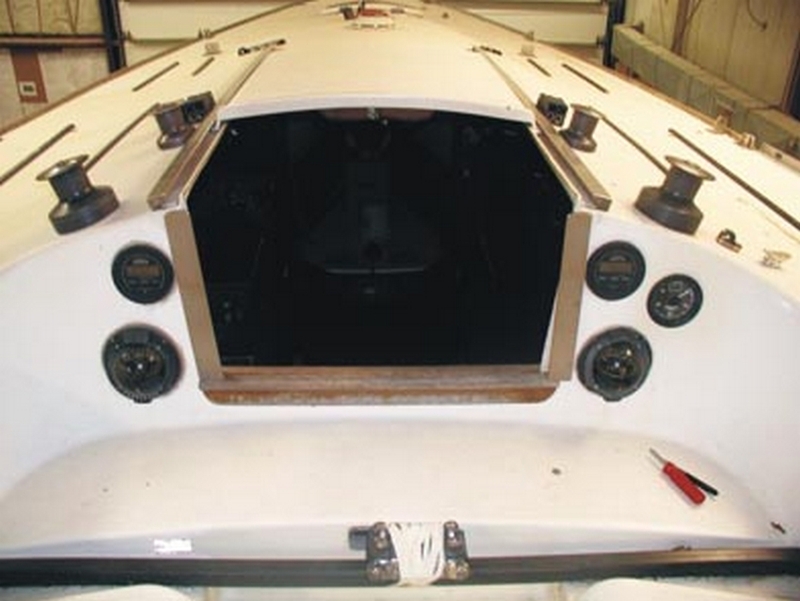 This was necessary because even after sanding, the surface remained somewhat irregular because of the chopped strand fiberglass used to build both the upper and lower deck skins. The neat epoxy flows to better fill this fairly level but uneven surface. The next step was to thicken 105/206 with 407 Low-Density Filler to a consistency slightly thicker than mayonnaise. 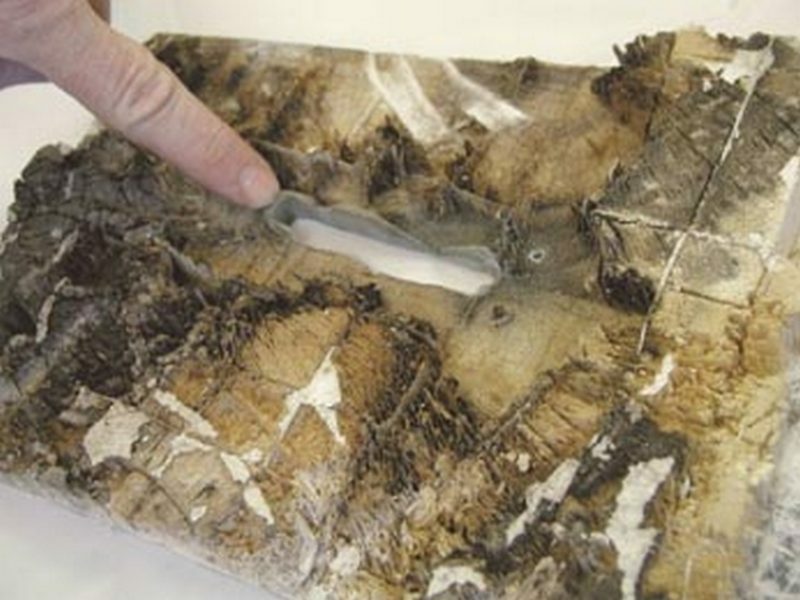 With an 809 Notched Spreader, a small amount of this “core bedding” mixture was applied around the edges of the repair against the existing core; more was spread out over the neat, uncured epoxy already brushed on the area. The core was then draped over a 10″ diameter PVC tube. Then core bedding mixture was applied in the cuts between the blocks as they opened, both in the 0° and 90° directions, when the tube was rolled. Then the filled core was fit in place and compressed down, squeezing out any excess bedding mixture. Finally, the repair area was cleaned up, all excess bedding mixture was removed, and any voids or gaps were filled using a squeegee, taking care to maintain the 12:1 bevel (below). A layer of release fabric was placed over the repair and worked down with a squeegee, and everything was allowed to cure completely. The next step involved cutting fiberglass for the patches and laminating them in place. As mentioned earlier, both the top and bottom fiberglass skin of the deck laminate is completely built using chopped strand construction. 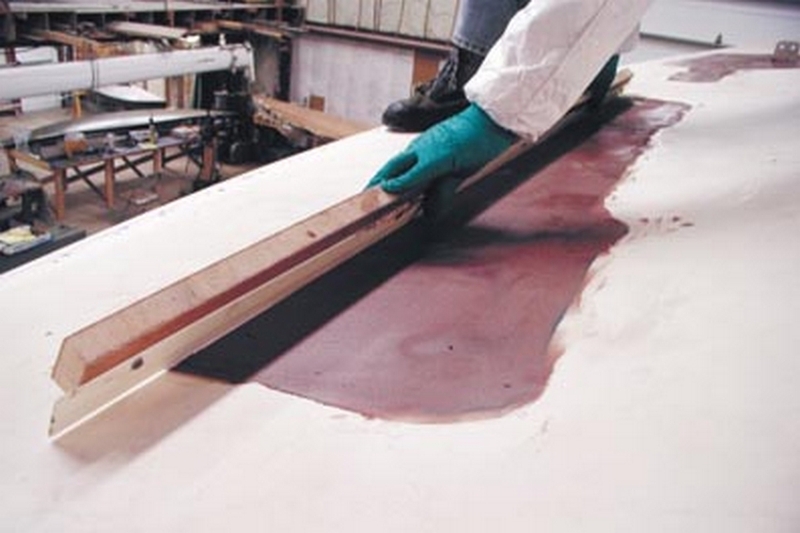 This was undoubtedly achieved using a chopper gun, which was and continues to be, widely used in production boat building where polyester or vinyl ester resin systems are used. 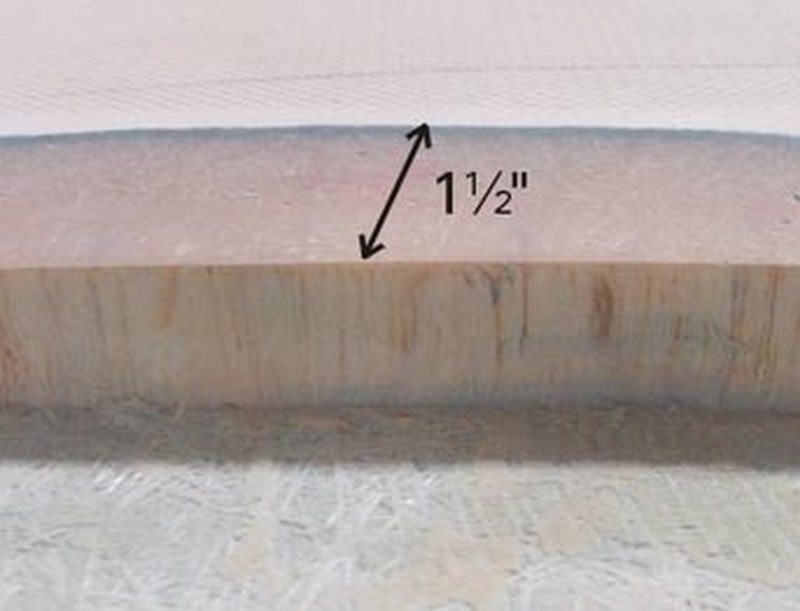 The thickness of a piece of removed deck skin measured with calipers was approximately 0.14″. Instead of doing the whole repair in chopped strand mat alone, I decided to use Episize™ 738 Biaxial Fabric with mat, which is a 15 oz/yd2, ±45° fabric with an 8 oz chopped strand mat on one side. The main reason was that I could build up the same skin thickness with only two layers of the 738 as opposed to 3-4 layers of chopped strand mat. 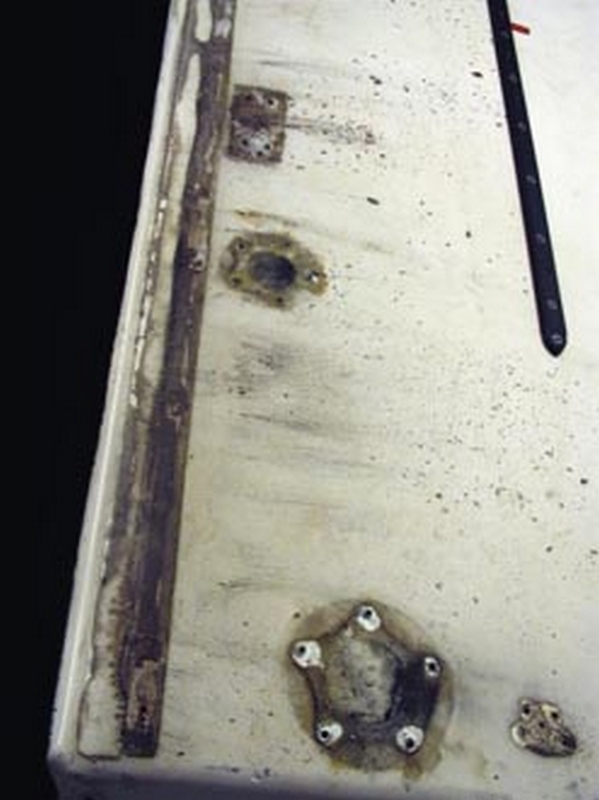 Measurements indicated that two layers of 738 would make the repair slightly lower than the surface of the surrounding deck. This depression would eventually get filled and sanded. The repair patch technique mentioned starts with the 12:1 bevel that was ground before the core went in. Then, two pieces of 738 glass were cut to shape for each repair area. The bottom, or first piece in, got cut so that it fit about ½” smaller than the outer edge of the bevel around the circumference of the repair. The top piece was cut so that it was about 1″-1½” smaller around the same circumference. 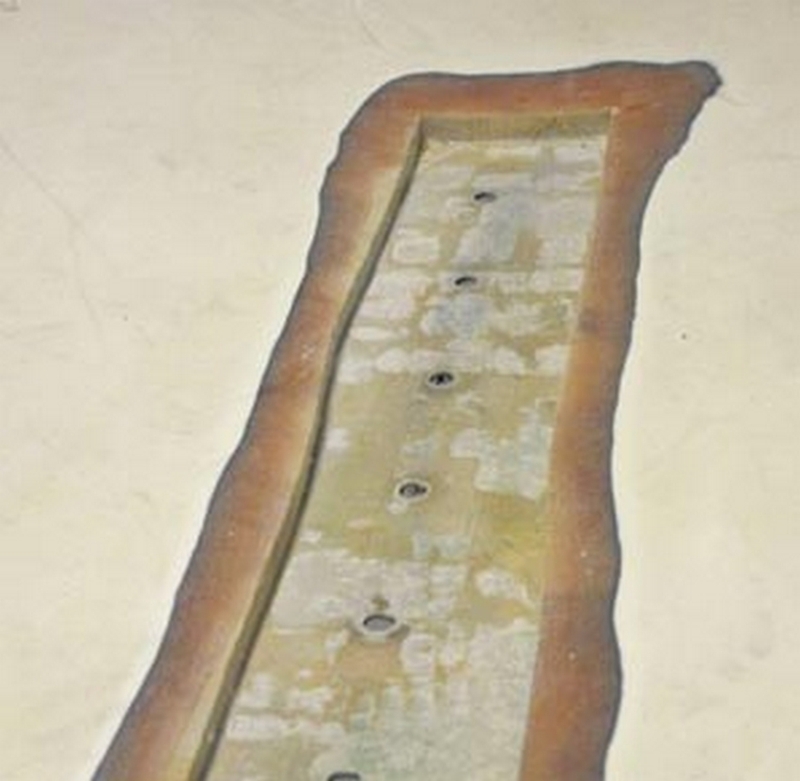 Using WEST SYSTEM® 105/206 and a squeegee, the two patches were laminated into each repair area, the larger piece going in first followed by the smaller one (below). 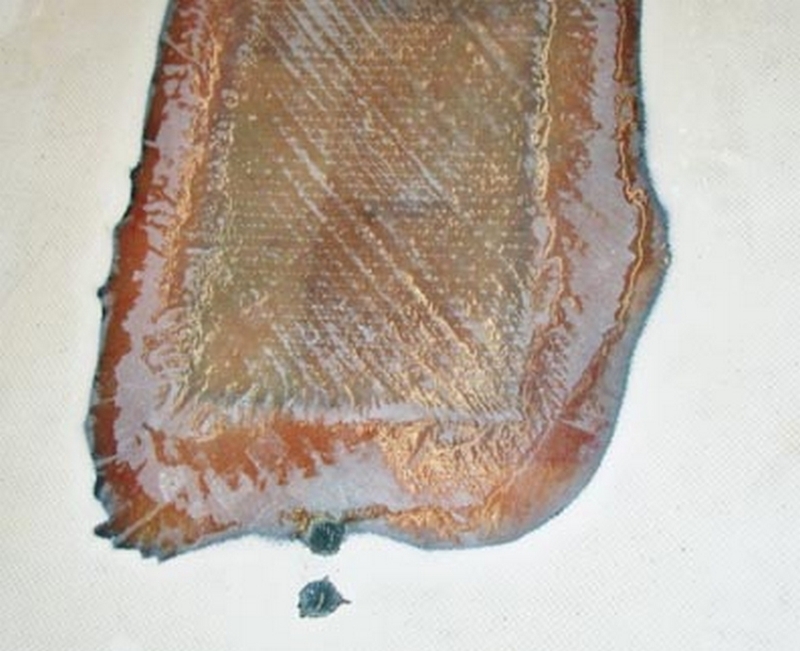 We are very confident based on testing done at GBI that this repair technique (described in detail in Chapter 4 Fiberglass Boat Repair & Maintenance) will produce the strongest repair possible. Once again, 879 Release Fabric was used to firmly squeegee the repair laminate in place, to compact the fibers, and to create a no-prep surface for fairing. 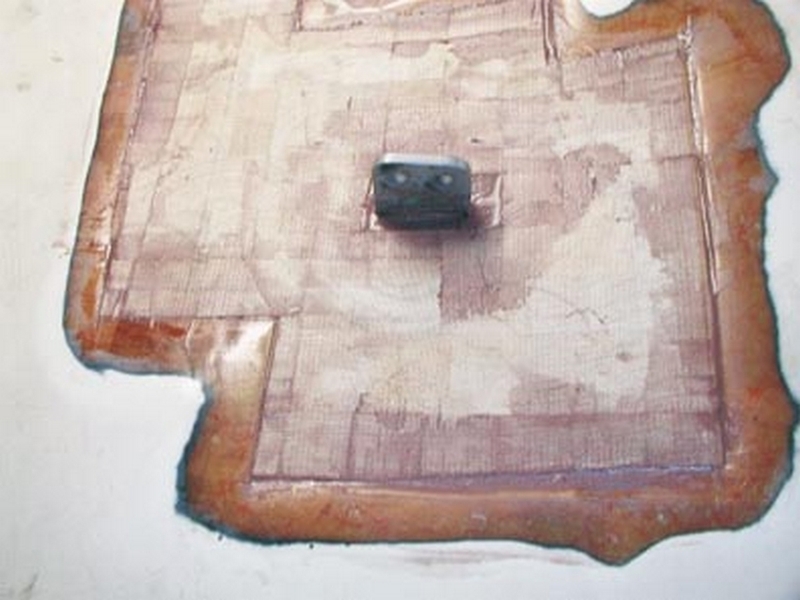 Once the epoxy cured for a few days, the release fabric was removed. Any rough edges or high spots around the circumference of the repairs were sanded off with an orbital sander. Then a fairing mixture of 105/206 with 407 Low-Density Filler was prepared to a consistency of peanut butter. The higher the percentage of 407, the easier the sanding would be. I made a special tool using an old heavy mainsail batten mounted to a piece of wood so that half the batten was off the wood (below). The tool was long enough to span beyond the length of the long repair. The areas that needed filling were slightly overfilled with the fairing mixture using a squeegee; then, the batten tool was used like a long spreader to smooth and scrape off excess mixture. This was allowed to cure a couple of days. Then a 4′ longboard (long sanding block) was used to sand the filled patches. High and low spots were identified, more filler was applied where needed, and the repair was sanded with the longboard again. Once the repaired area was smooth and fair with the deck, a neat coat of 105/206 was rolled over the sanded 407 surface to fill any porosity and to ready the surface for painting. After all this, I was finally back to where I started. Having replaced the damaged balsa core, I was ready to properly reinstall the hardware to avoid more damage, and get back to applying a new non-skid surface to the deck (below). In the next issue of Epoxyworks, I describe the details of that portion of the project. I should be nearly done by then.